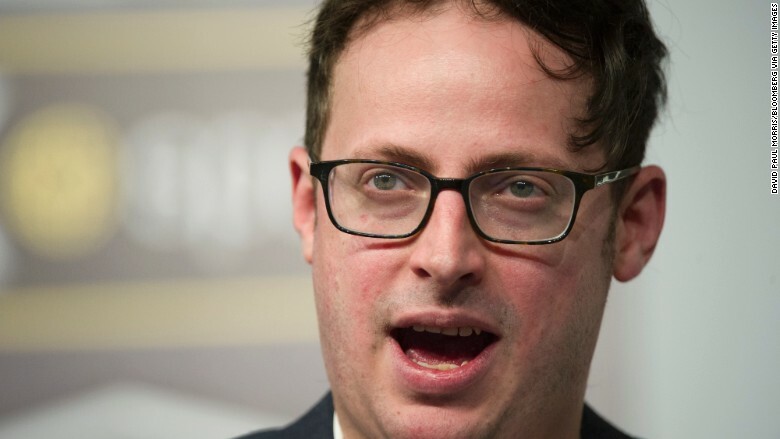 FiveThirtyEight editor-in-chief Nate Silver says popular website Vox.com steals content "all the time." Nate Silver called out Vox.com on Monday, accusing the popular explainer website of "stealing" content. 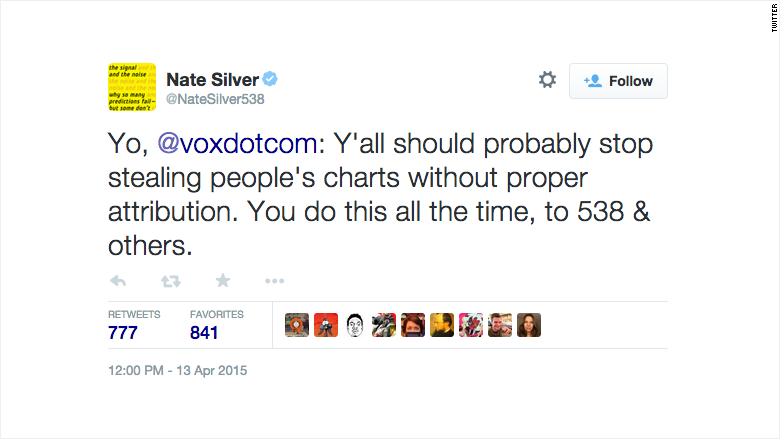 Silver, the editor-in-chief of the data journalism site FiveThirtyEight, levied the charge on Twitter. "Yo, @voxdotcom: Y'all should probably stop stealing people's charts without proper attribution," Silver said. "You do this all the time, to 538 & others." In a subsequent tweet fired off about an hour later, Silver claimed that only about 20% of the maps shared by Vox Maps -- a companion Twitter feed to Vox.com -- were created by Vox. "Always a link to a Vox story, rarely to original source," Silver lamented. In an email to CNNMoney, Silver said that, despite his critique, he's still a fan of Vox. "There's a lot to like about Vox and I'm sure they'll get better about this stuff," Silver said. "Everyone makes oversights, certainly including us." Silver said the impetus for his criticism was today's post by Vox executive editor Matt Yglesias. Yglesias wrote that Silver had drawn peculiar conclusions from a graphic illustrating the popularity of a number of high-profile politicians. In the middle of his post, Yglesias embedded the graphic, which was created by FiveThirtyEight. Silver said that the post did not originally contain a link back to FiveThirtyEight when it was published this morning (links have since been added). But he noted that his objection isn't limited to "this one post." "Rather, it's that Vox's attribution practices often come up for critique in my Twitter feed, especially from graphic and interactive journalists who know how hard it is to produce informative and attractive graphics," Silver said. He added: "Comparable websites -- like Huffington Post or Business Insider or Bleacher Reporter -- seem to be a lot better about this, at least based on the referrals we see when they link to one of our stories." Writing on his website, Vox.com editor-in-chief Ezra Klein responded to Silver's complaint on Monday afternoon. Klein conceded that the post that drew Silver's ire had fallen short by not including a link to the original source. "This was carelessness, not malice, but it's a violation of Vox's internal standards," Klein wrote. "Our policy requires attribution, and any time we fail that policy is inexcusable. It's a betrayal of what makes the web positive-sum. Silver's right to be upset by it. He has my apologies." Silver and Klein share a similar history. They both distinguished themselves at venerable newspapers -- Silver at the New York Times and Klein at the Washington Post -- before taking on more autonomous roles elsewhere. After he became something of a rock star during the 2012 election, Silver left the Times in 2013 to team up with ESPN and ABC. Klein bolted WaPo in early 2014 to join Vox Media, which also houses sites such as SB Nation and The Verge.